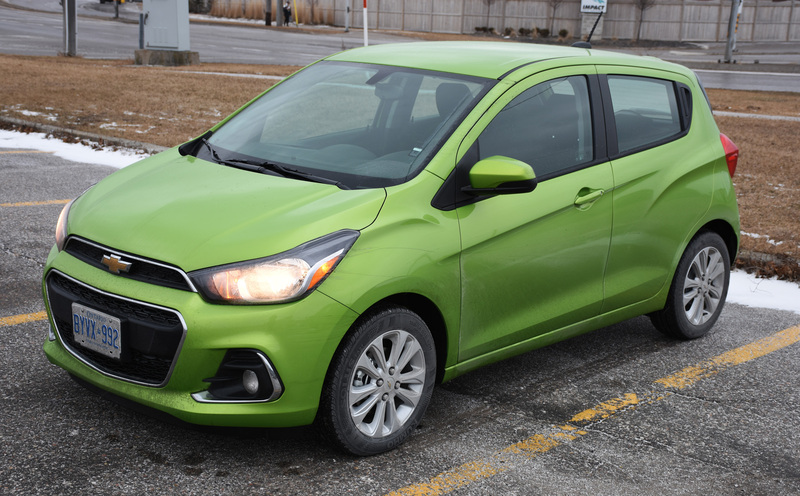 Chevrolet calls the 2016 Spark “the ultimate mobile device.” Not because it’s almost as small as one, but because it is a connected device unto itself. Unveiled in January at a base price of $10,000, the Spark is effectively the least expensive brand new vehicle to offer 4G LTE and support for both Apple CarPlay and Android Auto. I say ‘brand new’ because it’s possible to get the latter two platforms with an aftermarket head unit from Pioneer, Kenwood or JVC that can cost as low as $600-$700 plus installation. For some, that may be a better option, given that the Spark is not likely to appeal to a wide demographic. There is an irony with the Spark that might be hard to understand. Here is a $10,000 (starting price, at least) car that comes with the kind of connectivity features lacking in other vehicles that are 10 times more expensive. Indeed, much of GM’s various lines going back to last year are lacking CarPlay and Android Auto. Going back to 2014, most didn’t have 4G LTE, either. It’s one of those unusual dichotomies that is ever so present in the auto industry today. How is it that a diminutive and affordable vehicle can offer much better smartphone integration than, say, a 2014 Cadillac Escalade? Or even a high-end luxury ride from another manufacturer? The Spark’s rollout early in the year doesn’t mean it’s an outlier in GM’s lineup on the technology side. Both 4G LTE and CarPlay/Android Auto are essentially going to be in almost everything the company launches this year, except that with backward compatibility already an impossibility for previous vehicles, there is an intrigue that sets in here. Fully loaded, the Spark can cost up to $17,000, yet not a single dollar in upgrades goes to infotainment software (SiriusXM is one exception). All of that is already included from the outset. This is a vehicle that feels like it could be a line of smartphone cases. It comes in 10 different colours: Lime, Electric Blue, Salsa, Kalamata, Toasted Marshmallow, Splash, Silver Ice, Black Granite, Summit White and Titanium. The model I test drove for a week had a few particular upgrades, chiefly automatic transmission, aluminum wheels, six-speaker system, cruise control and steering wheel controls, among others, that put it at about $15,295. No sunroof or leather interior to ramp it up further. 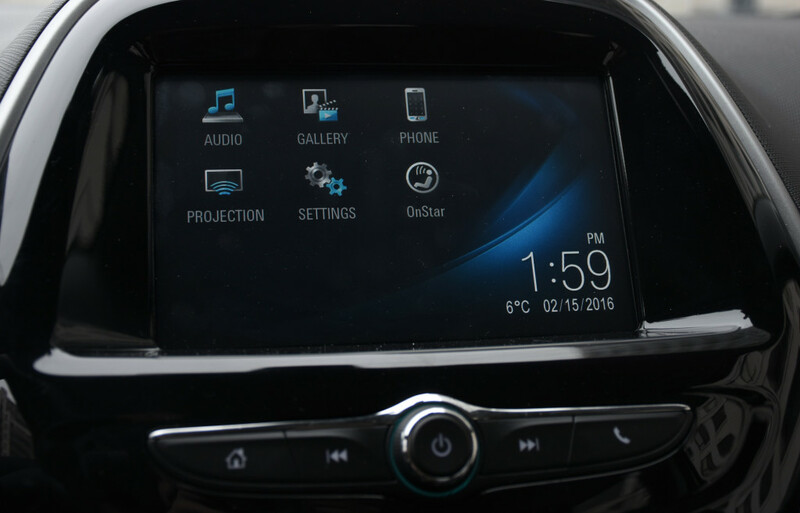 ChevyLink, the Chevrolet-branded infotainment system, forms the software foundation that everything else sits on. It’s not especially deep here, meaning that there is no built-in navigation map or specific apps, either proprietary or third-party. OnStar is onboard, and comes with a five-year Basic Plan that includes the RemoteLink app, vehicle diagnostics and security. The familiar blue OnStar button opens up communication with a live agent to search for a point of interest or even top up data for the 4G LTE connection. 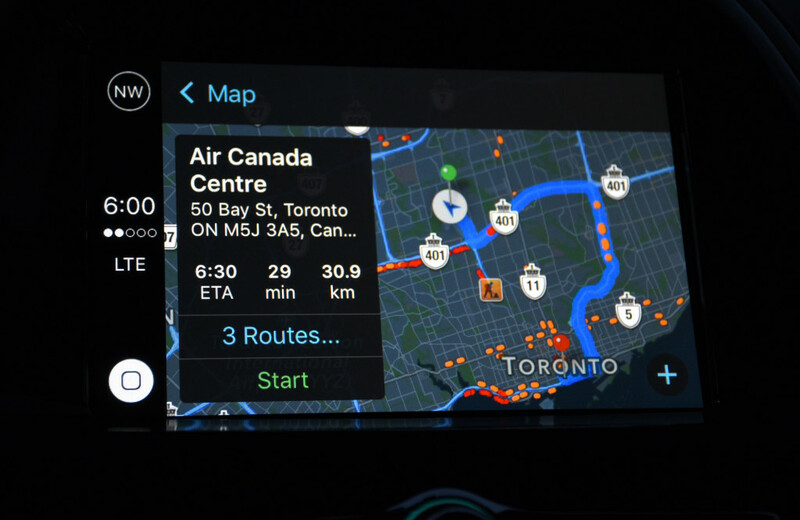 I didn’t see a built-in navigation map within ChevyLink, as has been the case before, suggesting that Google Maps and Apple Maps take the reigns. The 7-inch capacitive touchscreen is bright and supplemented by hard buttons below: power (which doubles as a volume knob), home, track skipping and calling. Steering wheel controls add more, such as voice activation, volume, calling and scrolling to avoid taking your hands off. Pressing the voice button when CarPlay or Android Auto are running triggers Siri and Google Now, respectively. To get steering wheel controls, however, costs extra as an upgrade at the dealership. Underneath the hard buttons on the dash, there are knobs for climate control. A USB port and Aux-In jack are in the compartment under that for connecting smartphones or playback devices. 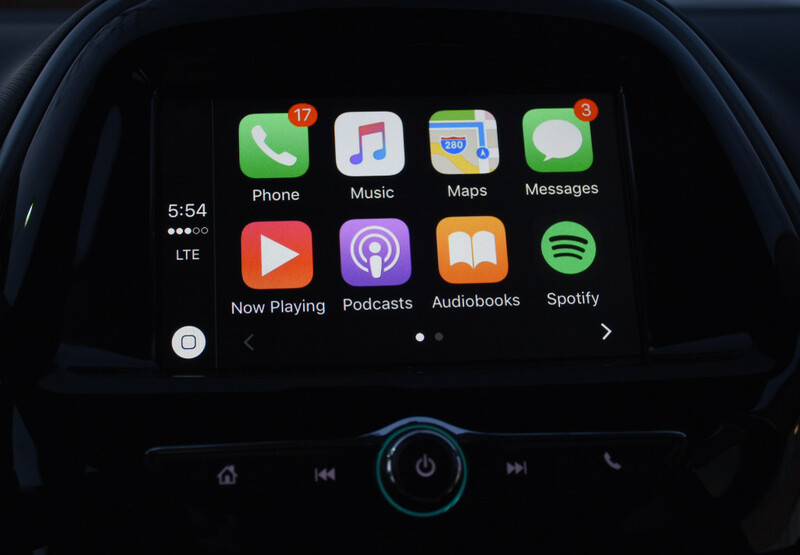 Normally, CarPlay and Android Auto include an icon for a direct path back to the automaker’s system, but neither does here because the physical home button below does it instead. For the 4G LTE connection, the Spark comes with 3GB of data for the first three months, whichever expires first. Beyond that, monthly plans generally start at $20 for 1GB of data, going up to $250 for 10GB of data good throughout a 12-month period. Unlike Android Auto, which enables a Bluetooth connection with the system upon setup, CarPlay can work without pairing. It also doesn’t set up pairing, either, leaving that to the user to do manually. The phone must be plugged in to use either platform, as the Spark doesn’t support wireless. In light of the onboard Wi-Fi, it’s not yet clear if that is a feature it could handle once Apple and Google roll it out. Outside of those two platforms, there is standard AM/FM radio and Bluetooth audio streaming. SiriusXM is only available as an upgrade. A gallery app for viewing images and video when parked is included, too, though I’m not sure what the point of it is. This was one of the easiest experiences I’ve had yet in integrating a smartphone in a vehicle. CarPlay was up and running in seconds. 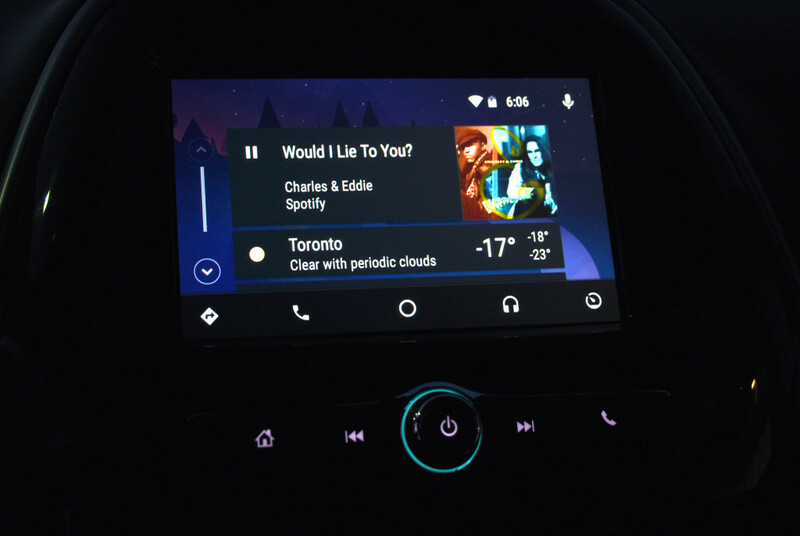 Android Auto, which has usually come with a more convoluted setup process, was also ready to go in under 60 seconds. Bluetooth pairing required going to Settings and then Search Devices to complete. Some of the glitches I’ve noted in the past continued here, too. CarPlay would connect quickly, only to then crash and stop after about one minute. Disconnecting and reconnecting the iPhone did the trick, but that isn’t always safe to do when on the road. It didn’t happen every single time, but it was enough to note here. It’s the second iPhone I’ve experienced this with, so hopefully Apple patches it to make it more stable moving forward. Android Auto felt a little more stable, rarely making a fuss about anything. The same issues and glitches I’ve noted in a previous review remain the same, but by and large, the platform worked well in the Spark. I tried it with five different phones: the BlackBerry Priv, LG G4, HTC One A9, Moto X Play and ZTE Axon. There was virtually no difference between them. 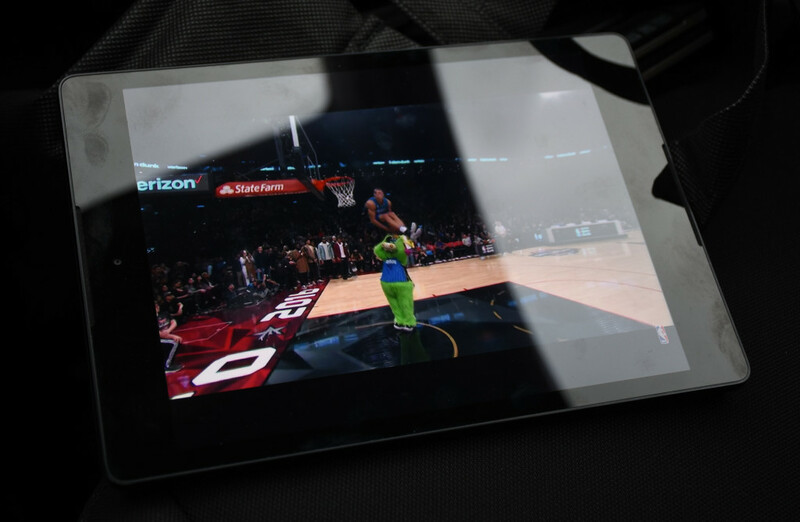 I even brought in a Nexus 9 tablet at one point, connecting it to the in-car Wi-Fi network and running Android Auto from there. It wasn’t the best experience, but proved to play well when streaming music or video while untethered from the infotainment system. In either case, making and taking calls, or sending and responding to messages was simple and effective. I never really had to touch my phone when doing those things, which came as no surprise because of how seamless they are when steering wheel controls make it so easy to tap into Siri and Google Now. Without those controls, triggering Siri can be done by holding down the home button or saying “Hey Siri.” Google Now can be activated by holding down the voice button on the top right. Unfortunately, Siri can’t launch apps in CarPlay like Android Auto can. I could say, “play music in Google Play Music” and it would oblige. With CarPlay, I could only hone in on music I had stored on the device to play through the Apple Music app. Apple’s streaming service continues to be curtailed through CarPlay, leaving out any easy way to access the bevy of content the service offers upfront. Speaking of apps, the free OnStar RemoteLink for iOS and Android is a nice addition that adds extra value. It can lock/unlock doors remotely, remote start, turn on headlights or honk the horn on command. It can also manage the Wi-Fi hotspot, keep track of the data plan, fuel mileage, tire pressure and oil life. With an OnStar subscription, this can go deeper, as in sending turn-by-turn directions to the vehicle and getting regular diagnostic updates, among other things. This is one area where Google Maps has an advantage though. Caching offline maps works well via Android Auto, cutting down on data usage, both on your phone’s data plan or the in-car hotspot. Apple Maps doesn’t do the same thing, so there is no way to use offline mapping. The best I was able to do was using Navmii, except I could only go on audio cues because there was no way to project the map onto the dash screen. There is a secondary benefit that may not be obvious right away. Despite GM’s assertions that the in-car 4G LTE always piggybacks onto the fastest network by geography, I found speeds fluctuated from as high as 25Mbps to as low as 4Mbps — all within the Greater Toronto Area. It mirrored my previous experience when testing the connection in a Cadillac ATS Coupe two years ago. Spotify continues to be finicky. If the app is frozen in the background for too long before plugging in the iPhone, it may not play music through CarPlay at all, or play it only if the app is open and onscreen. On a few occasions, pressing the home button paused the music, playing back again only when reopening it again, all for reasons I’m not clear on. Once I killed the app on the phone and plugged back in, the glitch stopped. 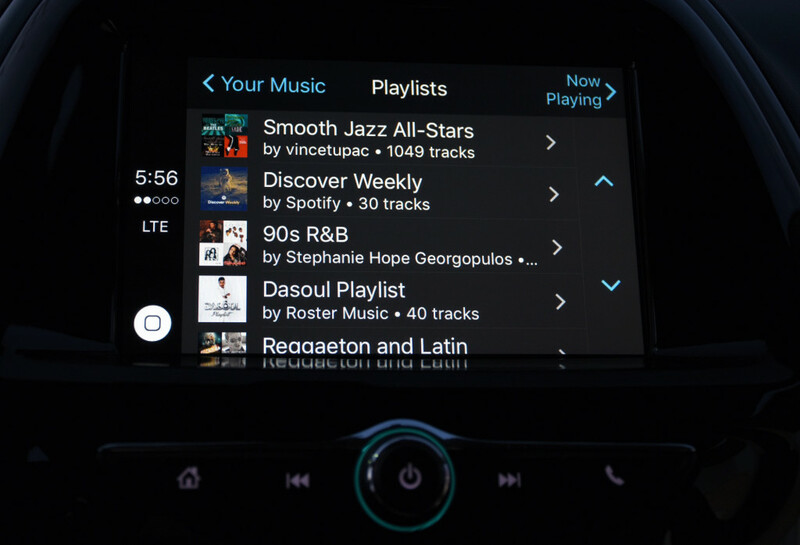 This would also happen in Android Auto, so I’m going on the assumption that Spotify may need to fix that. Google will also have to figure out a more intuitive way to scroll through lists because, in spite of the safety reasoning, it is terrible. Other supported music and audio apps on one of the platforms or another — Google Play Music, TuneIn, Stitcher, Overcast — are essentially limited in the same way. Bluetooth streaming is easy, and is a good way to play music or audio from any smartphone, regardless of operating system. Metadata appears onscreen and playback controls work through the buttons on the dash or on the steering wheel. While notifications won’t appear onscreen this way, it is still possible to compose or respond to a message over Bluetooth. This is much easier to accomplish with steering wheel controls because doing it otherwise usually requires handling the phone in some way. Playing music from an unsupported app on either CarPlay or Android Auto is possible, including metadata and playback controls, except there’s no way to see a list of tracks and playback has to be initiated on the phone first. I was able to listen to SoundCloud this way easily. The Spark is far from being a game-changer, and is unlikely to appeal to a wide demographic, but the fact that infotainment and in-car Internet access is available on the base $10,000 model is hard to ignore. The experience, at least as it pertains to infotainment, is not likely to be any different than what will be featured in higher-end GM vehicles releasing this year. That’s very telling about how some automakers are looking at integrating Apple and Google into their dashboards. Holdouts remain, mind you, but GM is making it clear that it will roll it out in vehicles at the widest price point spectrum. Buying a car is a very personal choice, much like purchasing a smartphone is. GM thinks the two are in common with the Spark, partly explaining why the company markets the car the way it does. The size (or lack thereof) speaks for itself. The vehicle’s messaging focuses instead on the connectivity inside. It’s a good move because it’s one of the top reasons to consider this car if your budget is limited.